My first question here and i hope that its not to obvious or stupid. My problem: I have a number of $x$ values ( $x$ can vary) that follow a normal distribution. I can calculate all normal descriptive statistics (minimum, mean, quartiles and so on), but those $x$ values only describe a small fraction of a potentially much bigger range of values (which still follows the same distribution and the average should not vary much). So what i really want is to estimate the minimal value of the unknown full distribution. Something like an estimation of the minimal x-intercept of a known distribution with given slope and tip value. 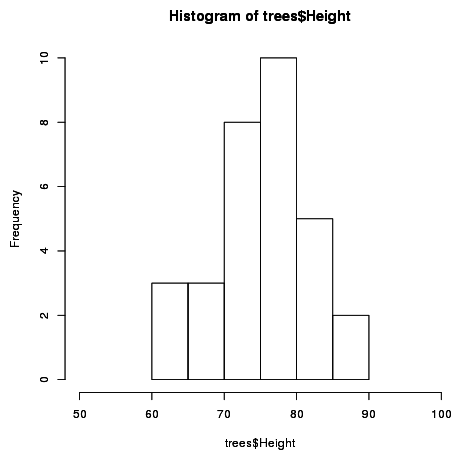 Imagine for instance the standard trees dataset in R (see picture below). I don't want to know what is the minimal value of the given height values (60), but instead estimate the possible true minimal value in a most accurate way (might be $height<=50$). Is this possible or just stupid? Or am i missing a basic statistic principle which already allows me to estimate those values? There is no minimal value or "x intercept" since the tails go off to infinity. What you may want to look at is tail probabilities. For instance, for a N(0,1), try finding out P(X>4). Very small probability. Not the answer you're looking for? Browse other questions tagged r normal-distribution estimation or ask your own question. Why doesn't this represent a normal approximation to the binomial? What is the name of the density estimation method where all possible pairs are used to create a Normal mixture distribution? How to determine distribution from Sleep data min/max/mean values in R?